The gold colored card on the inside of this lovely packaging, look like the marks used for the practice of keeping progress with the flow of time, when no other devices are available. On the outside of this album, the resemblance is that of an old passport with deteriorating edges. There seem to be a long history, imagined or not, behind this small 3″ packaging, even though I am holding it in my hands for five minutes so far. Inside it, as I play it, the magic begins. Through Circulation of Light, Nathaniel Ritter (who stands behind the label ‘Brave Mysteries’, the band ‘Kinit Her’ and other projects, offers a soft piano playing that sounds distant at moments, and more immediate at others. The music echoes into itself and creates small ripples of beautiful, touching vibrations, mending together a light aura that engulfs the music and give it a brilliant presence. Being a short mini album (19 minutes), I let it play over and over again, as I notice the spiraling effect it possess with each additional run. The music, emotional, minimal and inspiring, gains more presence and power with each time the album plays again. Ritter creates a long, mediating ceremony; capable of lasting for hours (a three hours run was my longest play for this album) with only less than 20 minutes of music. I think that this is where ‘Twilit Homeland’ has its power. The circulation of this album ends as I open my eyes, stare at the album cover for another minute, and press Stop. There is a sense of emptiness and descent back into the hard chair I remember now that I am sitting on. 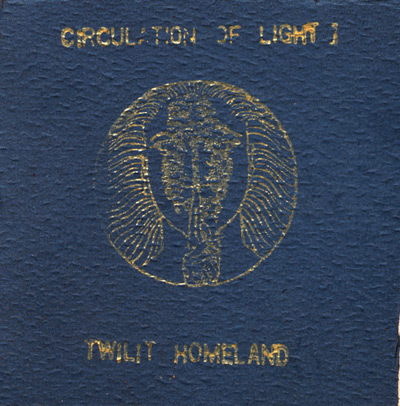 ‘Twilit Homeland’ is indeed a long walk on a short, yet long lasting road. This is a great experience, well worthy for your time. Check it out!